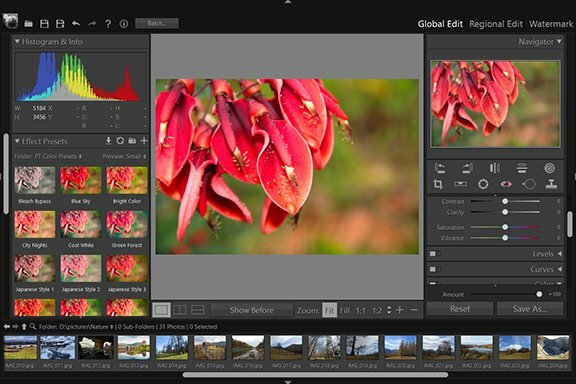 Color Correction - Global Edit - - User Guide of PT Photo Editor - Easily rescue problem photos. Make every shot its best. 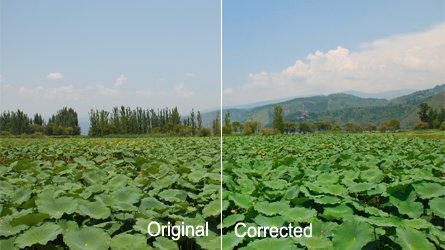 The Color Correction panel is used to correct the image color as one would see when shooting. It's also can be used to apply an artistic effect to a photo. The sliders adjust the red, green, and blue in the image individually. 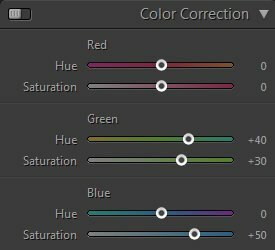 In general, adjust the hue first, and then adjust its saturation. Red-Hue: Changes the red color. Moving to the right changes the red to orange, moving to the left changes the red to raspberry. Red-Saturation: Adjusts the saturation of the red. Moving to the right increases the saturation of red, moving it to the left desaturates the red. Green-Hue: Changes the green color. Moving to the right changes the green to turquoise, moving to the left changes the green to yellow. Green-Saturation: Adjusts the saturation of the green. Moving to the right increases the saturation of green, moving it to the left desaturates the green. Blue-Hue: Changes the blue color. Moving to the right changes the blue to purple, moving to the left changes the blue to aqua. Blue-Saturation: Adjusts the saturation of the blue. Moving to the right increases the saturation of blue, moving it to the left desaturates the blue.